For the last 7 years, MYAC has shared an exclusive partnership with the Lang Lang International Music Foundation. 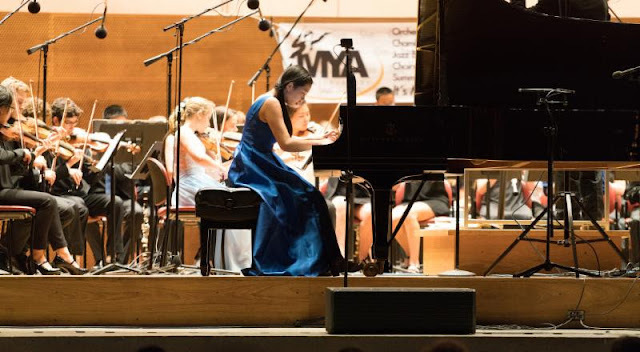 The International Summer Music Summit is a chance for a small group of exceptionally gifted young pianists under the age of 16, hand-selected from around the globe by the internationally acclaimed pianist Lang Lang, to gather in a week-long celebration of collaborative music with MYAC’s Symphony Orchestra members. Through homestays with our host families, chamber performances, sightseeing activities, and concerts at world-renowned venues around Chicago, the students of MYAC and the Lang Lang “Young Scholars” form friendships that last far beyond their short stay in Chicago. Collaborations have included chamber concerts at Chicago Botanic Garden and concerto performances with our Symphony Orchestra at Millennium Park for an audience of thousands. New this year, the Summer Music Summit will also include a concert at the beautiful and historic Cantigny Park in Wheaton, IL. The free concerts of the International Summer Music Summit provide a truly eye-opening experience for members of the Chicagoland community who may not ordinarily be exposed to live classical music, as well as for MYAC’s orchestra members. “You’d be amazed at the number of times people just come up to me and say ‘I was just walking by and I couldn’t go, I couldn’t leave,” says Dr. Dennis about the Millennium Park concert. MYAC’s own Symphony Orchestra member Kimie Han recently completed her graduation recital as a 2016-2018 Lang Lang Young Scholar at Carnegie Hall’s Weill Recital Hall earlier this month. She studies piano with Alexander Korsantia and Brenda Huang and is a 17-year-old senior at Lake Forest High School. She hails from Lake Forest, IL. Kimie describes working with Lang Lang himself in Switzerland this summer. The experience taught her to manage any lack of confidence on stage by fully sharing the expression of music with her audience. “Working with Lang Lang is such a unique experience because even though he is very down-to-earth and serious about producing the best possible performance, he creates this energy onstage that is so incredibly free and wild. So when you perform with him, all of the nerves just seem to go away, and instead the performance becomes solely about enjoying the music and sharing it with your audience,“ she says. Being a member of MYAC over the last several years provided Kimie with the foundation to achieve her personal and musical goals. She plans to apply for university this fall to obtain a double degree in Piano Performance and either Biology or Neuroscience.